No colors from artificial sources. No high fructose corn syrup. 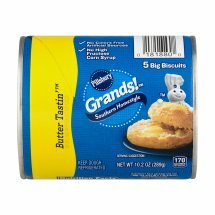 ™ Southern Homestyle Big Biscuits Butter Tastin™. Natural and artificial butter flavor. Enriched Flour Bleached (Wheat Flour, Niacin, Ferrous Sulfate, Thiamin Mononitrate, Riboflavin, Folic Acid), Water, Soybean Oil, Sugar, Baking Powder (Sodium Acid Pyrophosphate, Baking Soda, Sodium Aluminum Phosphate), Hydrogenated Soybean Oil, contains 2% or less of: Dextrose, Salt, Potassium Chloride, Xanthan Gum, Natural and Artificial Flavor, Butter, Beta Carotene (for Color).